Texas Governor Rick Perry on Monday said that he wants no part of the Affordable Care Act’s expansion of Medicaid. 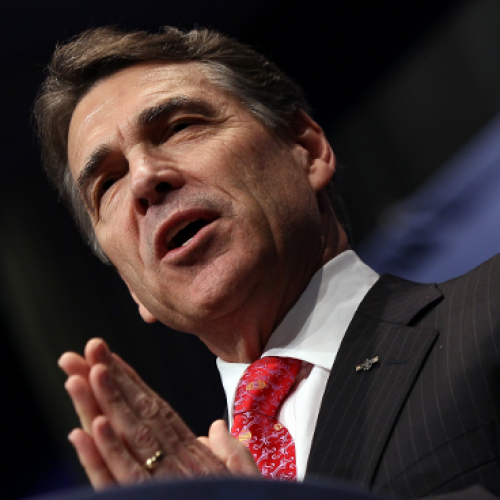 Perry isn’t the first Republican governor to take this position. Five others, including Florida’s Rick Scott and Louisiana’s Bobby Jindal, announced their opposition to the expansion last week. But Perry surely did so with the most rhetorical flourish. Actually, it’s not God or the Founders whom Perry should thank. It’s Chief Justice John Roberts and the six Associate Justices who invalidated the Act’s Medicaid expansion, even as they upheld the rest of the law. Originally, Obamacare presented states with a stark choice: Expand eligibility for Medicaid, so that all people making less than 133 percent of the poverty line can enroll, or lose all federal Medicaid funding. Now states can stick with their current Medicaid arrangements, which typically cover only certain classes of poor people, without losing the money Washington already provides. By opting out of the expansion, such states would lose only the money the federal government would have provided to cover the newly covered populations. That makes opting out sound like a rational choice. By any reasonable standard, it isn’t. As you may have heard by now, the Medicaid expansion is the ultimate sweetheart deal. For the first three years, the federal government is providing 100 percent of the money to cover these new populations. By 2020, the contribution will decline to 90 percent, so that states have to provide 10 percent of the funding on their own. But that’s still a far better deal than the states get on Medicaid right now. Nationally, state spending on Medicaid should rise by less than 3 percent because of the expansion, according to projections from the Congressional Budget Office. The bang-for-the-buck here is virtually unprecedented. And that’s before accounting for the many ways the Medicaid expansion will help state budgets, by reducing the need for spending on direct provision of care to the indigent and by generating economic activity that will lead to more tax revenues. As Greg Sargent wrote recently, relying on Urban Institute estimates, many states could actually make money by participating in the expansions. I know: Rick Perry doesn't really care what the CBO or Urban Institute has to say. But surely he pays attention to the people in his own state—and by “people,” I don’t simply mean the millions of low-income Texans for whom the expansion would provide insurance, although in any civilized society that ought to be enough to clinch the deal. The Texas medical safety net consists of geographical districts, each with its own set of public or quasi-public hospitals and clinics. These districts have their own taxing authority. The more care they must provide to the uninsured for free, the higher they have to push those taxes. Private hospitals provide charity care, too, but they also have to make up for the losses—in part, by charging higher premiums to private insurers. In these respects, as Rick Ungar points out in Forbes, one consequence of turning down federal Medicaid dollars is higher costs, in the form of property taxes and private insurance premiums, for middle-class Texans. Hospitals around the country have gone along with these cuts precisely because they expected the expansion of Medicaid to pick up the slack—in other words, they were giving up one source of funding for treating low-income people with the expectation that another, the Medicaid expansion, would (more than) replace it. If states decline the new Medicaid money, as Perry is threatening, providers will get absolutely hammered, with consequences not just for them but for their patients and for the people whose taxes and premiums finance them. The irony, Anderson noted, is that the Perry Administration has quietly worked closely with Texas providers and local officials to negotiate a special waiver from the federal government, reconfiguring the existing Medicaid program so that Texas gets more federal money in exchange for, in theory, making its system more efficient. As Sarah Kliff noted last year in the Washington Post, that effort may have a real upside. It's "schizophrenic," Anderson says of Perry's posture, but also a reminder that sometimes political rhetoric belies what policymakers actually do. All Texans, middle class as well as poor, should hope Perry's new rhetoric turns out to be similarly deceptive.